International shipments require additional postage, which is not added to the order automatically. If you do not click the appropriate button below for international postage it will delay your order. Postage for domestic US shipments is added to the order automatically. All replacement rod tips come with the lillian attached. Replacements for tips that have swivels (Suntech, Daiwa Enshou, etc) come with the swivel and lillian attached. When ordering replacement parts, please be aware that for all Japanese tenkara rods, keiryu rods, seiryu rods and tanago rods, the segments are numbered starting from the tip. The tip segment is #1. The segment next to the tip is #2 and so on. Count down from the tip, not up from the grip. Longer rods have more sections, but the tip is ALWAYS #1 for all Japanese rods. The fifth up from the bottom is a different part for the Field Master 44 than it is for the Field Master 39 or 53 or 62. The fifth down from the tip is the exact same part for each of the rods (it is interchangeable for all rod lengths). If you order a Field Master No.5 you will get the fifth down from the tip, as numbered in the photo below. Please disassemble the rod to count the segments. Be sure that you don't have one part still stuck inside another. Check the website for that rod model to see how many total sections there are. Be sure you are right. Replacement parts are all special orders. Parts that I have "in stock" are taken from a rod in inventory, and then a replacement is ordered from Japan. Once I order the part from Japan I cannot return it or exchange it. If you order the wrong part, you now have a spare because it cannot be returned. Field Master 39 parts count. The rod shown above is a Suntech Field Master 39. It is a 9 section rod with two zooming sections. The zooming sections have a Z after the section number and the grip section always has a B after the section number. The Nissin 2-Way 450ZX is an 11 section rod with one zooming section. The zooming section is #10Z and the grip is #11B. The Nissin Air Stage 190 is a 4 section rod that doesn't zoom. The 4 parts for the Air Stage 190 are #1, #2, #3 and #4B. Replacement parts are sold individually. The tip segment is just one segment (#1) not three segments together. 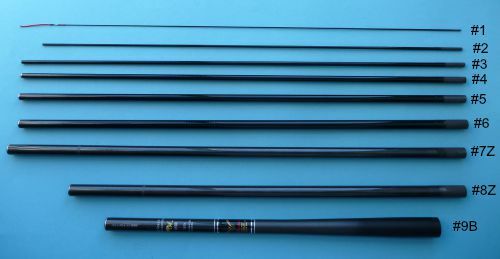 The only exception is with the Daiwa Hinata tanago rod, for which #1 will not slide through #2, so #1 and #2 are sold as a unit. Keeping a parts inventory is a nightmare, which is why access to this page has been by request only. I try to put "Out of stock" notices on the rest of the website. There are no "Out of stock" notices for parts, and some of the parts listed here are out of stock. Out of stock parts can be ordered from Japan. I also have parts that I have not yet listed here. Plus, I may have the part (which I can take off a rod from inventory) but not have the price for that specific part, and have to ask my supplier in Japan for the price. If you need a part that you don't see here, ask for it. If it is for a rod I sell, I can get it (except for the Shimotsuke Tenkara 33 and 36 #2). The button below is the parts above the grip section, not for the grip section itself. I probably have the part in stock but have not gotten them on this page yet. If you need a part, just ask for it. Please note! The replacement parts might not fit your rod. Shimotsuke moved production from one factory in China to a different factory, and the parts made in the second factory do not fit the rods made in the first factory (and vice versa). I have no way of knowing which factory made your rod or these parts. That is the reason I stopped carrying the Shimotsuke Tenkara 3.3 and 3.6. If you purchase replacement parts and they do not fit, you may return them for a refund of the parts price. The shipping charge is not refundable. Note: the Kurenai HM parts and the Kurenai H parts are not interchangeable. Please do not use the Parts button to purchase a grip section. Note: The first Field Masters I received were the Field Master. Since the first order, subsequent rods were Field Master II. The zooming sections for the Field Master and the Field Master II are not the same. The Field Master II has II (in red) just above the 39 or 44. Please note: The #7 part in the first column IS NOT the 7th section of the Field Master 39, which is a zooming section (#7Z in the second column). Note: Parts for the Suikei Keiryu Special medium and stiff are not interchangeable. The medium has the following characters 硬中硬 in front of the 39. The stiff has the following characters 硬調 in front of the 39. The following parts are for the medium rods. Parts No1 through 5 fit all lengths of the TenkaraBum Traveler. Do not use this button for grips or zooming parts. Payment is through PayPal but you don't need to have a PayPal account. You can pay with your credit card. Domestic shipping is $4 via USPS first class mail (2-5 day delivery). If you are ordering replacement parts ONLY the additional postage will be $6 to Canada or Mexico and $10 to other countries. Please click the appropriate button. If you are ordering replacement parts and other items together, please request a quote before ordering. International shipments are via USPS international first class. Delivery times depend on the destination, but range from two weeks to over a month.